Thanks to the partnership forged between Dakin Farm and our friends at North Country Smoke House, across the river in New Hampshire, we are able to expand our offerings to you with these exciting NEW, Gourmet Sausages (see our fun flavors in the drop down menu below). 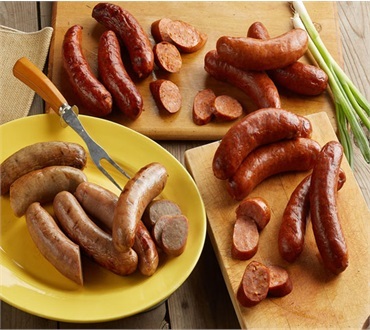 Part of what makes these gourmet sausages so special is that every ingredient is top quality, authentic, and chosen with care. Filled with coarsely ground, lean meats in unobtrusive, natural casings, each robust link is bursting with its own well-rounded palate of distinctive, natural seasonings. Our full menu of ethnic European and regional American recipes range from pungent old-world favorites to lean and subtle poultry sausages, each celebrating the melting pot that defines our country and the pride of the people that make them. Each variety arrives fully cooked and ready to savor. With each flavor ordered, you will receive two one pound packages (8 links). lacked flavor and would prefer slender over a fat link. that was how I had bangers and mash at an irish pub. Tasty and good quality. Although I love crunchy/snappy casings, the casings here are a little too tough. Not too spicy Perfect balance and lovely on potato long roll or slice in pasta. My husband enjoyed them so much he told me to make sure I buy more..
Easy to grill, great taste but spicy (I like this, too spicy for my wife). 4 per package, so quite expensive.